Billy Graham, the charismatic North Carolina pastor who took his evangelizing crusades around the country and the globe, died on Wednesday morning, according to officials of his organization. He was 99. Graham achieved a reach unlike any other evangelist, serving as a counselor or minister to a dozen U.S. presidents. He preached to an estimated 215 million people in 185 countries around the world during his life, and his message reached millions more as he maintained a near-constant presence on radio, television and the internet. Graham also wrote more than two dozen books, including his 1997 memoir, "Just as I Am," which was a New York Times best-seller. Graham was a steady presence among top leaders in this country, providing prayer and personal advice to every president starting with Harry S. Truman. 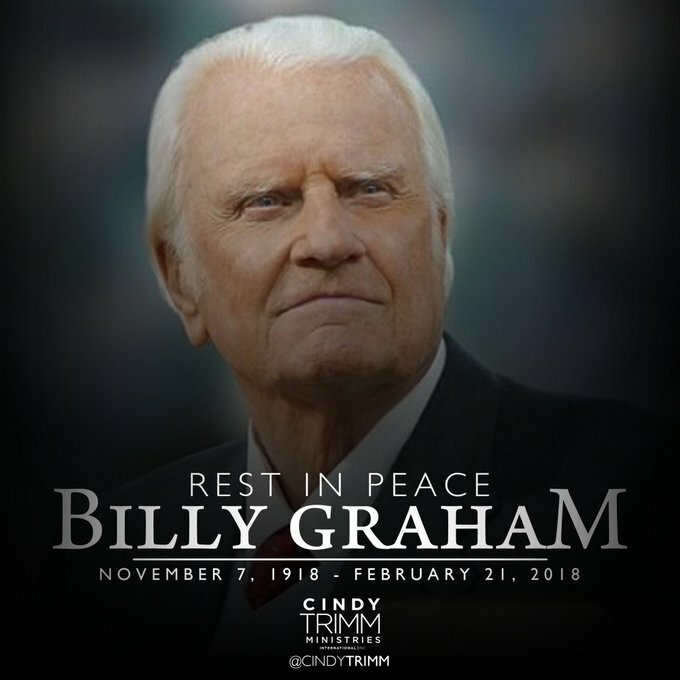 In recent years, he took on a reduced role, but still earned the praise of President Donald Trump, who in a tweet after Graham's death called him the "GREAT Billy Graham" and wrote: "There was nobody like him! He will be missed by Christians and all religions. A very special man." Graham died just before 8 a.m. at his home in Montreat, North Carolina, according to a spokesman for Samaritan's Purse, the nondenominational evangelical Christian organization headed by Graham's son Franklin. His longtime physician arrived approximately 20 minutes later "and said, quote, he just wore out," Graham spokesperson Mark DeMoss said Wednesday evening. Graham was diagnosed with Parkinson’s-like symptoms in the 1990s, DeMoss said. He said Graham died in his sleep. "It was described by the nurse and his doctor as a very peaceful passing; he was not in any pain,” DeMoss said. Graham's following was undeniable: The longtime evangelist appeared on Gallup’s list of the most admired men and women 60 times since 1955 — every year the research company asked the question. Born William Franklin Graham on Nov. 7, 1918, "America’s pastor" came from modest means and grew up on a dairy farm in Charlotte, North Carolina. He found his spiritual path at 16, charmed by the traveling minister and temperance movement leader Mordecai Ham. Graham later moved to Florida and was ordained there in 1939. "When it comes to spiritual things, my wife has had the greatest influence on my ministry," GrahFormer President Barack Obama tweeted that Graham was a "humble servant who prayed for so many — and who, with wisdom and grace, gave hope and guidance to generations of Americans." Televangelist Joel Osteen remembered Graham as a "hero" and tweeted, "Next to my own father, Reverend Graham was the most humble and gracious man I ever knew." And the archbishop of New York, Cardinal Timothy Dolan, recalled the influence Graham had on his household in the 1950s and 1960s. "There was no question that the Dolans were a Catholic family, firm in our faith, but in our household there was always respect and admiration for Billy Graham and the work he was doing to bring people to God," Dolan said in a statement. "Whether it was one of his famous Crusades, radio programs, television specials, or meeting and counseling the presidents, Billy Graham seemed to be everywhere, always with the same message: Jesus is your Savior, and wants you to be happy with Him forever." Graham is survived by his sister, five children, 19 grandchildren and many great-grandchildren, DeMoss said. The funeral message will be given by his son Franklin and other family members will make remarks. Graham will be buried beside his wife’s grave in a casket made by inmates at Louisiana State Penitentiary in Angola in 2006. Franklin Graham preached there in 2005, and after learning the inmates were making caskets for fellow inmates he asked if they could make one for his father and mother, DeMoss said. Invitations to the funeral will be extended to President Trump, Vice President Pence and to former presidents among others, DeMoss said.am said of Bell, who died in June 2007. Graham's body will arrive at the Billy Graham Training Center in Asheville on Thursday. On Saturday, a private family prayer service will take place and a motorcade will transport the body to the Billy Graham headquarters in Charlotte, DeMoss said. The body will lie in repose at the Graham Family Homeplace with a closed casket from 8 a.m. to 10 p.m. on at least Monday and Tuesday but that could be extended, he said. The private funeral service will be held on March 2 under a tent in front of the Billy Graham Library, in a tribute to a famous crusade Graham conducted in Los Angeles in 1949 that earned him national prominence, and which was held under a tent dubbed the "canvas cathedral," DeMoss said. Graham was known for his sense of humor and for maintaining a nonpartisan Christian view, which earned him some criticism. But his dedication to ministry and unity was most evident in his refusal to pay heed to segregation policies, forcing churches to integrate for his services. Still, Graham's reputation was not without controversy. It was rumored in the 1990s that he had been caught on tape agreeing with anti-Semitic comments made by then-President Richard Nixon during the Watergate scandal. Graham vehemently denied that he had, until the tapes were made public in 2002. The Jewish ''stranglehold has got to be broken or the country's going down the drain,'' Graham said, according to a 2002 New York Times article. Graham, 83 at the time, apologized for the remarks. As Graham aged, his son Franklin took over his ministries, while Graham returned to a quiet life in North Carolina — not far from the Billy Graham Library in Charlotte. "My home is in Heaven," Graham habitually said. "I'm just traveling through this world." Condolences poured in in the hours after Graham's death, with Vice President Mike Pence calling him one of the greatest Americans of the 20th century. Former President Barack Obama tweeted that Graham was a "humble servant who prayed for so many — and who, with wisdom and grace, gave hope and guidance to generations of Americans." Invitations to the funeral will be extended to President Trump, Vice President Pence and to former presidents among others, DeMoss said.